Take one look at the 2019 Colors of the Year and you should know that anything goes! The calming blues and greens selected by Behr, Kelly-Moore, Cloverdale, Diamond Vogel, Dutch Boy, and Glidden/PPG range from gently saturated to intense, but are tried and true. Benjamin Moore stands firm with a soft gray - an industry standard and the choice of most new construction and homeowners planning to update with paint. Pantone gives us a rich coral seen all spring and summer in fashions and fabrics. Akzonoble, maker of Dulux Paint, choose Spiced Honey - a medium-golden neutral shade safe to use just about anywhere, and which makes me almost smell the spices and honey! Pratt & Lambert’s Earthen Trail is a version of the fleshy beige-pink that’s trying to make a big comeback from the 60s. Some dated properties still display this color in wall-to-wall carpeting and paint. Do you dare? Sherwin Williams’ dark Cavern Clay and Dunn Edwards’ darker Spice of Life are best in small doses, in rooms where there are a lot of windows and natural light. Valspar’s 2019 selection of a dozen colors ranging from the tried-and-true neutral to pastels and jewel tones gives you a pallet to complement and contrast. In all things paint - remember that light has a great effect on the color you’ll see. Avoid mistakes by consulting a design professional before making your color selection. Carolina Spaces Furniture & Design provides professional color consultations and offers discounts on your paint purchase. Contact us at 1-855-SPACES-5. You've decided to sell your luxury property. You've painstakingly interviewed Realtors specializing in luxury listings, and you've carefully selected your listing agent based upon qualifications, statistics, testimonials and performance. As we discussed in a previous blog, luxury real estate requires luxury staging, so now is the time to put just as much effort into choosing a luxury home staging professional. Do you specialize in marketing luxury listings? Exceptional properties require exceptional home staging and you must partner with a knowledgeable and experienced luxury home staging professional. As you know, home staging is a marketing tool and the quality of the home stager's work (good or bad) will convey to the property and to you! You're the best - you need the best on your team. So how do you choose a luxury home staging professional? With HGTV and numerous staging books available, anyone can call themselves a stager and most stagers now claim to offer luxury staging services. While there are industry associations that provide training and ethical guidelines, there is no standard or test that measure's a stager's knowledge of core competencies as the staging industry in and of itself is unregulated. It is very common for stagers, even those who have undergone training, to post photos of rooms on social media sites and ask "How do I stage this?" The knowledge and service you receive from Stager A can be completely different from Stager B. You want to select the luxury home staging professional who knows exactly how to stage your property - and not hire the stager who runs to facebook pleading for instructions. 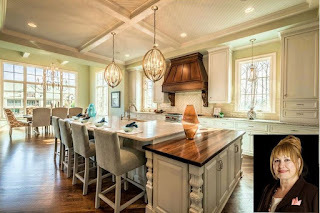 In our previous blog, we explained how luxury staging enters the realm of interior design, so in assessing a luxury staging professional's qualifications, one must look for staging as well as interior design education and affiliations. Do the credentials the stager lists require continuing education? You want someone who is up-to-date on current trends. Is your luxury staging project new construction? Then look for experience with new home sales as well as staging. Also, how many years has the luxury home stager been in business? A luxury home staging firm that looks good on paper may not actually deliver the quality that you want, so make sure to view current luxury staged homes in person before you make a decision. Are the rooms fully furnished to show lifestyle? Is the quality of furnishings appropriate for the price-point of the home? Is the furniture new, rented, or flea market finds? Lastly, make sure you evaluate the luxury home stager's statistics. What is their average time on the market for luxury homes in your price point? Improper staging can cause a home to linger on the market unsold. 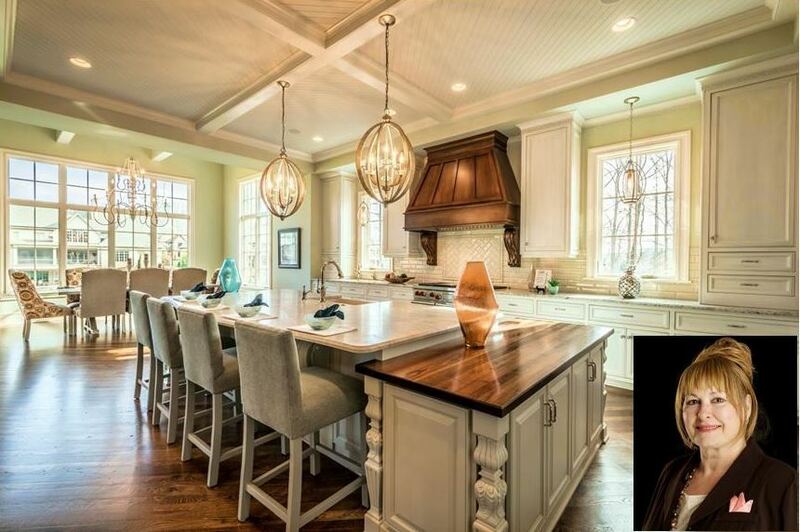 Has the luxury staging firm received any accolades for their successes? As we stated above, luxury staging enters the realm of interior design, so make sure to look for companies that have been honored for interior design as well as staging. And if your luxury staging project is new construction, look for recognition of showcase and model home projects. Carolina Spaces Furniture & Design - based in Lake Wylie, SC just south of Charlotte, NC - is the only home staging and design firm in the Southeast with advanced knowledge and certifications in the combined industries of Real Estate, Interior Design, Luxury Home Staging, Home Staging, New Home Construction, and New Home Sales. Our name brand and high-end furnishings inventory is unsurpassed. Our list of accolades demonstrates a proven track record of success over our company's 14+ years in business. Let our luxury home staging create the exceptional environment necessary for your property's successful sale! The team members of Carolina Spaces Furniture & Design are trained, educated, and licensed. Contact us at 1-855-SPACES-5 or visit CarolinaSpaces.com. Now that you've chosen a luxury home staging professional, how much can you expect the investment in luxury staging services to be? Stay tuned! 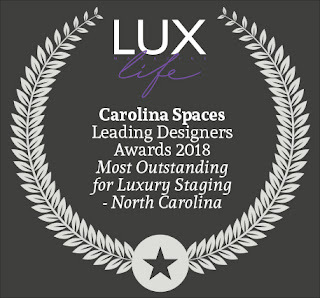 Carolina Spaces Furniture & Design - based in Lake Wylie, SC, just south of Charlotte, NC - offers award-winning, full-service interior design, professional home staging, model home merchandising and luxury home staging not just to the greater Charlotte area, but to all of the Southeast. Our model home merchandising and interior design services are also available nationwide. In all my years of preparing exceptional properties for sale, I can say one thing for certain – luxury homes require exceptional staging! 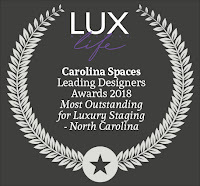 Carolina Spaces Furniture & Design has won many awards for Best Luxury Staging including the 2018 LUX Life Magazine Leading Designers Award for Most Outstanding Luxury Staging – NC, a UK-based international award. Most everyone is aware of what home staging is and how it works. While the principles are the same for staging the high-end luxury market, the process takes off in the direction of design. Luxury home buyers want to see the lifestyle they aspire to in a home - and the luxury stager needs to convey this. One cannot expect a top dollar offer for a multi-million dollar estate when the buyer is left to wander through empty, barren rooms that feel cold and uninviting. Staging is necessary to define the scale and flow of the rooms and luxury staging is needed to inspire those high-end buyers to fall in love with the home and the lifestyle it portrays. Not only must the stager have an eye for updating and details, but they must also have the experience and inventory to execute the project. The quality of the staging furnishings installed is directly related to the buyer's perception of the home's quality. How would laminate countertops affect a high-end buyer's perception of a luxury home? The same applies for furnishings! Will a discerning buyer with expensive tastes pick up on that poor quality table that is the wrong scale? You bet! Will they notice the cheap sofa that appears to be a nice style but when they sit on it, they sink down into the broken springs on this garage sale find? All of this affects the buyer’s overall perception of the home and does nothing to create that "dream lifestyle.” Inappropriate furnishings are revolting and discourage buyers by weakening the home’s overall luxurious feel. Lavish fabrics and linens, high-end new furniture, eye-catching new accessories and exceptional new artwork are required for luxury staging. When done correctly, luxury staging seamlessly complements the luxurious finishes within the home. Luxury staging needs to show buyers how they would live in the home if they moved in tomorrow. At Carolina Spaces Furniture & Design, we have decades of experience providing customized staging for luxury properties. A luxury home may require made to order furnishings in a specific style and finish. We give the house what it needs. We also procure custom upholstery and customized art for our luxury stagings. Our staging helps sell luxury homes faster and for a higher sales price, even those that have languished unsold. Our awards, testimonials and statistics speak for us. Contact us at 1-855-SPACES-5 or visit CarolinaSpaces.com. How do you choose the right luxury staging professional? Stay tuned for our next blog!